An alert displayed when at least one of the requisitions is marked as urgent, prompting the purchaser to process them. An Order button used to issue a purchase order to a supplier. This stage’s modeling should be performed in the Tutorial 11-12 project, you imported at the end of the previous stage. When the list of approved requisitions is displayed, we would like to check whether it includes requisitions whose Urgency is Urgent. Zoom to Generate Approved Requisition List. Add a Basic/Action. Name it Check if Requisition is Urgent. Add to it a trigger and an exit. Name the exit Yes. Mark the process as repetitive. 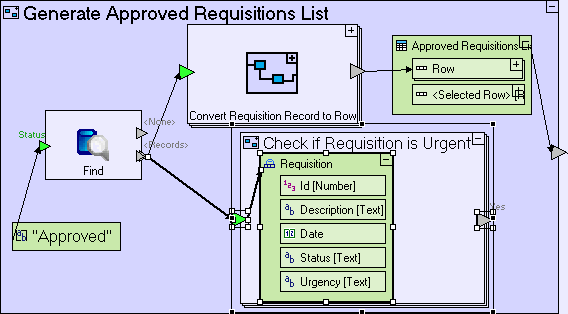 Create flow linking Find/<Records> to the trigger of Check if Requisition is Urgent. Zoom into Check if Requisition is Urgent. Drag a Requisition database record. Create a flow linking the trigger of Check if Requisition is Urgent to Requisition. The check is performed using a new template Branch, which accepts a value as input and activates the exit whose name matches the value. Add a Flow Control/Branch template ( ). 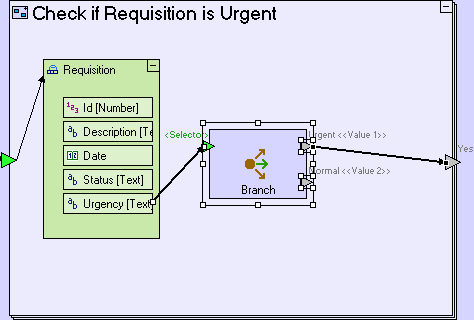 Create a flow linking Requisition/Urgency to the <Selector> trigger of Branch. Create a flow linking the Branch/Urgent exit to the Yes exit. When an urgent requisition is received, Branch will activate its Urgent exit, causing an application flow that activates the Yes exit of Check if Requisition is Urgent. Activating an exit means that regardless of whether the exit outputs a value or not, any flow originating from it will be activated, so that if the exit is linked to a trigger, that trigger will also be activated, which in-turn means that the process containing that trigger may be activated. The functionality we are implementing does not need to perform anything when a non-urgent requisition is retrieved; therefore no flow is defined from the Branch/Normal exit. The exit can actually be deleted – we leave it here to improve the model’s readability and for possible future enhancements of the model. If the Check if Requisition is Urgent/Yes exit is activated at least once, we would like to display an alert to the user. This is done using the Alert template. Check if Requisition is Urgent – in which case the alert will be displayed repeatedly for each urgent requisition. Generate Approved Requisitions List – in which case the alert will be displayed only once, regardless of the number of urgent requisitions, but before the requisition list is populated (which occurs outside the process). 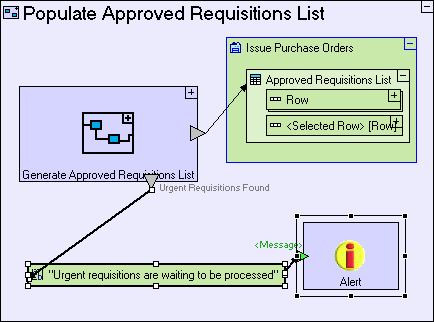 Populate Approved Requisitions List – in which case the alert will be displayed simultaneously with the requisition list being populated. Zoom out to Generate Approved Requisition List. Add an exit to it. Name it Urgent Requisitions Found. 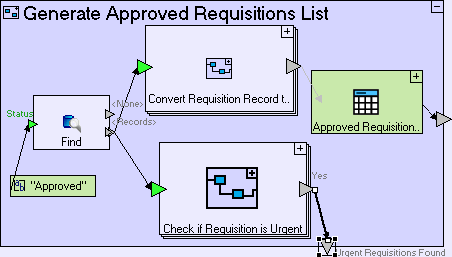 Create a flow linking the Check if Requisition is Urgent/Yes exit to the Generate Approved Requisition List/Urgent Requisition Found. 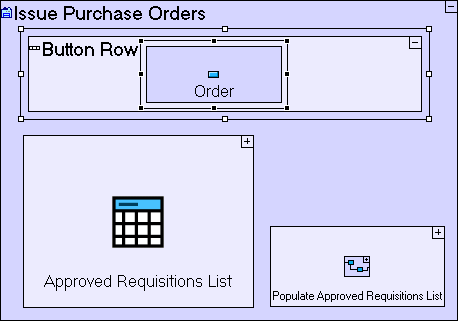 Zoom out to Populate Approved Requisition List. Add a Constants/Text. Name it Urgent requisitions are waiting to be processed. Create a flow linking the constant to Alert/<Message>. Create a flow linking Generate Approved Requisition List/Urgent Requisition Found to the “Urgent requisitions are waiting to be processed” constant. Click the Purchaser perspective tab. Click the Issue Purchase Orders view tab. You should see an alert popup, as in the screenshot below. Zoom out to the Issue Purchase Orders view. Add a Display/Row. Name it Button Row. Zoom into it. Add a Display/Button. Name it Order. Zoom into the Order button. Add an ancestor reference to the Issue Purchase Orders view. Add a Display/Popup. Name it Create Purchase Order. Add a trigger to it. 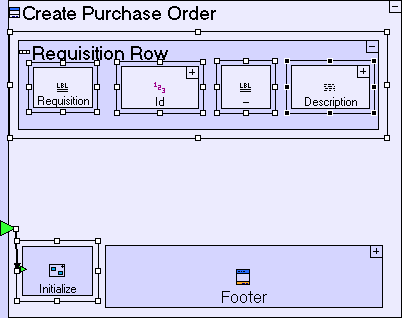 Create a flow linking Issue Purchase Orders/Approved Requisitions List/Selected Row to the trigger of Create Purchase Order. 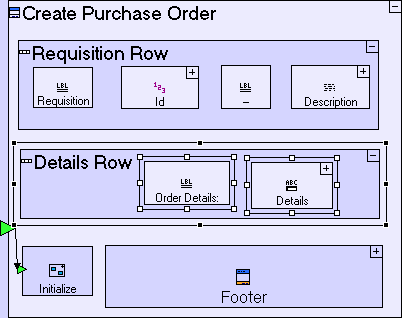 The Create Purchase Order popup will only open if Get Table Selection exits through the <Selected Row> exit, and since the selected Requisition Row data structure is also passed in the flow, we will have immediate access the details of the selected requisition inside Create Purchase Order, without having to retrieve it again. Click the Order button (before selecting a row). Nothing should happen, as no row has been selected. Select a row from Requisition List. Import the sample project Tutorial 12-13 and use it as the basis for the next stage of the tutorial. 1. Add display elements, for displaying Requisition details in the Create Purchase Order popup. Initialize it with data from the selected row. Add Display/Row. Name it Requisition Row. Add a Basic/Action. Name it Initialize. Add to it a trigger. 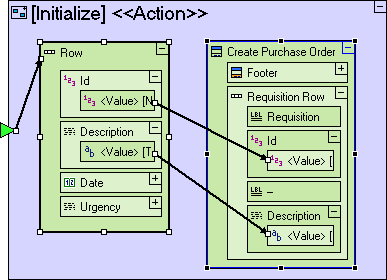 Create a flow linking the trigger of Create Purchase Order to the trigger of Initialize. Add a Display/Label. Name it Requisition. Add a Display/Number Display. Name it Id. Add a Display/Label. Name it – (hyphen). Add a Display/Text Display. Name it Description. 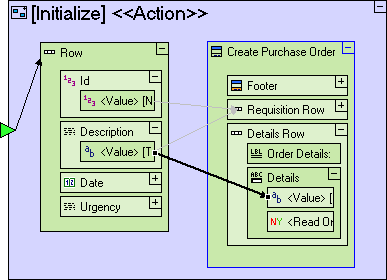 Drag a Requisition Row (to create a display data element). Link the trigger of Initialize to it. Add an ancestor reference to the Create Purchase Order popup. Link Requisition Row/Id/<Value> to Create Purchase Order/Requisition Row/Id/<Value>. Link Requisition Row/Description to Create Purchase Order/Requisition Row/Description/<Value>. Add Display/Row. Name it Details Row. Add Display/Label. Name it Order Details:. Add Display/Text Input Field. Name it Details. 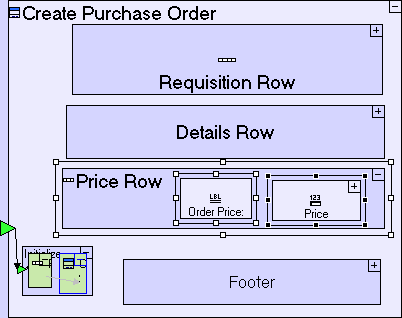 Link Requisition Row/Description/<Value> to Create Purchase Order/Details Row/Details/<Value>. 3. Add a Price input field to the Create Purchase Order popup. Add Display/Row. Name it Price Row. Add Display/Label. Name it Order Price:. Add Display/Number Input Field. Name it Price. 4. Create a Submit Order button, used after selecting a supplier to issue the purchase order. Rename the OK button to Submit Order. Add a Control trigger (through Add Element). Note that in the sample project provided, the application model includes a validation warning, due to the fact that the Close Window sub-process of the Submit Order button has a mandatory trigger (Control) with no flow into it, which means that as it stands, clicking the Submit Order, will not close the popup. This issue will be solved in the next stage, once flow is defined in the next stage. You may now proceed to Stage 13, in which we are going to learn techniques for managing relational data.